With such standouts as Andrew Luck, Michael Floyd, Alshon Jeffery, Lamar Miller and Robert Griffin III, the 2012 NFL rookie crop is a premium lot. 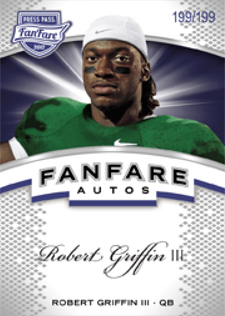 2012 Press Pass FanFare Football follows the same line with a high-end, all-autographed release. Boxes come with five autographs. Base autographs are printed on chromium stock, ensuring the prospects and their signatures pop. Also available are three autographed inserts: Gridiron Graphs, Paydirt and Next Level Ink. Each of the inserts, which are printed on holofoil, come in five levels and are numbered to 99, 50, 25, 10 or 1. 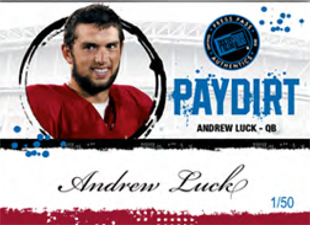 This is the second set from Press Pass to take advantage of their non-NFL exclusive with Andrew Luck, runner-up for both the 2010 and 2011 Heisman Trophy. 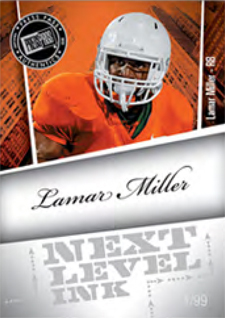 In total, more than 60 prospects have signed cards in 2012 Press Pass FanFare Football. 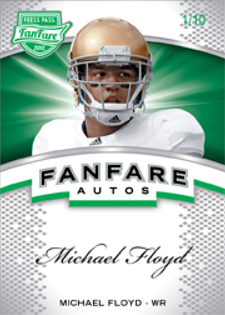 Every card in 2012 Press Pass FanFare Football is autographed. More than 60 prospects of the 2012 NFL rookie class included. Base autographs are printed on high-end chromium stock. Next Level Ink highlights football's biggest prospects. Available in five levels, cards are numbered to 99, 50, 25, 10 or 1 and printed on holofoil stock. Paydirt focuses on offensive players. Another autographed holofoil insert, cards are numbered to 99, 50, 25, 10 or 1, depending on the level. 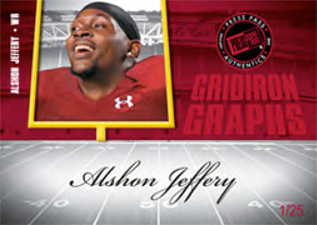 Top college players are on display with Gridiron Graphs, which also use holofoil and numbering to 99, 50, 25, 10 and 1. Packs come in a custom high-end box. I really like this stuff. They’re nice looking cards and since I’m more of an auto collector than a card collector, buying some boxes of these was a no brainer for me.